Hello again lovelies! I hope everyone is having a fabulous week. I cannot believe that it is half way over, and that Christmas is just around the corner! I have another outfit from Ro & De Noir for you today, and some exciting news! They are giving all of you, my wonderful followers, 30% off your purchase! You can shop with them HERE and just use code "MEGHAN30" at checkout for your discount. Please don't forget to tag me (@meggiefrue) and the wonderful Ro & De Noir team (@roanddenoir) in any of your Instagram photos so I can see what you picked out! 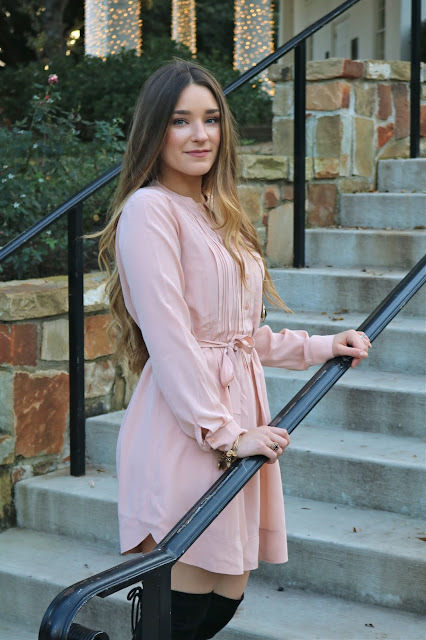 I am absolutely loving this beautiful silk blush dress from them. I styled it for the winter months with a fun jacket and some over the knee boots, but it would also be lovely in the spring while it is still a little chilly. This color has been so popular this year, and we are about to see much more of it next year. Pantone named TWO colors of the year for 2016, one being Serentity (a very beautiful light purpley-blue, almost like a periwinkle) and the second being Rose Quartz, the exact color of this dress! 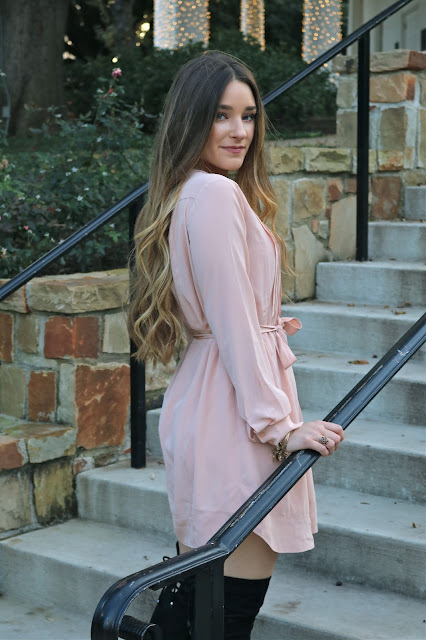 I hope you enjoy this pastel winter outfit and happy shopping!